Finding a natural sleep alternative is a hot topic these days. As more and more people are enlightened about the dangers that old, fire-retardant bathed mattresses bring, natural latex mattresses and other natural options are becoming popular. At the rate that natural latex and innerspring mattresses are rising to fame, it won’t be long until demand gets strong enough to pull down prices to a lot more affordable ranges. The reason why natural mattresses cost so much more than your average non-organic conventional mattress is that the latter is made using less careful and less health-conscious methods that make the end product potentially harmful to health. Natural latex mattresses are ideal for those who wish to stay far away from the harmful fumes that old mattresses give off. Despite the popularity of natural latex mattresses, many people are still confused about latex being a natural product. Latex may sound like a chemical name to some, but it is actually a natural product that is harvested from a rubber tree. It is the very sap that comes out of the rubber plant, harvested using a method that is not much different than the process of harvesting other natural products like maple syrup. The rubber sap is mixed with a concoction of other natural products and then baked to achieve its soft foam state. In the end it comes out 97% pure. 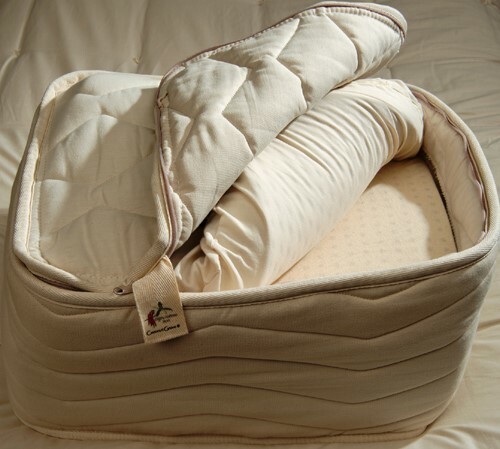 Natural latex, in its purest form makes an extremely comfortable, healthy, and supportive sleeping surface. Natural latex mattresses conform to the body, making them the perfect choice for those who experience discomfort due to pressure points. Latex likewise provides support to keep the body, particularly the spine, in alignment. The soft surface even allows for greater freedom of movement, allowing you to position and re-position your body in the most comfortable manner to bring you the best sleep throughout the night. Finally, natural latex offers dust mite and mold and mildew resistance, keeping you away from these unhealthy contaminants.